Tooth scaling involves the mechanical use of a dental instrument that scrapes away bacterial plaque and calculus from the tooth. Sometimes this device may be electric, known as an ultrasonic or sonic scaler. Scaling is performed on the part of the tooth that is exposed below the gum line (the part of the tooth you can see). This area is known as the coronal or "crown" of the tooth. 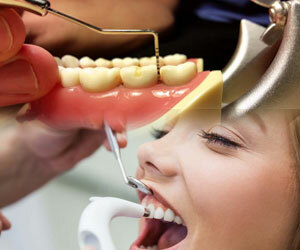 At our dental clinic, we use the Mectron Piezoquatro technology. The mectron unit's small tip and high frequency scaling tool along with its water spray technology delivers higher patient comfort and makes the procedure for the removal of calculus (tartar) more time-effective. The Piezoquatro enables a more gentle and effective scale within a shorter treatment timeframe than conventional scaling tools. Also, with the use of Turbodent, with Sodium Bicarbonate powder at high pressure, along with water spray, you will have all your teeth with their natural color shade, wihtout any stains, or black spots. The categorization of periodontal condition and how patients are treated. Until recently, when a patient called his general dentist to make an appointment for an exam and cleaning, he generally got exactly what he expected regardless of the seriousness of his periodontal disease. If the patient had serious problems with his gums, and if the hygiene team thought the disease could not be halted with a simple cleaning, that patient was referred to a periodontist (gum specialist). Things are beginning to change now, and not every new patient who schedules a "cleaning" will actually receive an "ordinary" prophylaxis, which is the type of cleaning he may be used to. Indeed, that patient may not receive a cleaning at all on the first visit. Moreover, the "cleaning" may involve as many as five separate appointments, often with numerous shots of local anesthetic to make the scraping of the teeth tolerable. Each office will have its own categorization of hygiene patient. For ease of discussion, I have listed the five classifications I use in my own office. A prophylaxis is the type of cleaning that everyone expects when they get to the dentist's office. It involves scaling calculus above the gum line followed by ordinary flossing, and pumice polishing using a rubber cup on a slow speed handpiece (drill). Note that this procedure can be done only if the patient has little or no calculus below the gum line. In other words, a prophylaxis is performed only on patients with little bone loss and only minor, localized pocketing. When the dentist or hygienist probes the gums around the teeth in a "normal" patient, he finds the probe goes no deeper than two or three millimeters below the gum line. A prophylaxis is not appropriate on patients who have periodontal problems beyond minor redness and bleeding. A prophylaxis patient can expect a full dental exam, x-rays and his/her cleaning on the same initial visit. Sometimes, a new patient will present with so much plaque and calculus built up on their teeth that it is impossible to completely visualize the teeth, or to probe the depths of the patient's periodontal pockets. When this is the case, A normal prophylaxis is not possible, and a more aggressive procedure called a full mouth debridement is necessary. It involves a rough scaling to remove the bulk of the calculus and plaque from the roots (above and below the gum line) and the teeth. This will make it possible for the patient's gums to begin the process of healing, and just as importantly, it makes a thorough oral examination possible. A debridement removes most of the calculus buildup on the root surface. It is quite labor intensive and is more expensive than a normal prophylaxis. Often, the full mouth debridement is accomplished on the initial office visit. Sometimes, it can be done without anesthetic, and sometimes shots or topical anesthetic are necessary. A second cleaning visit (called a fine scale and prophylaxis) is always necessary. Often the oral examination is put off until this second cleaning visit. At that time, the patient is assessed for possible further periodontal treatment. A patient in this category can expect a minimum of two cleaning visits, or sometimes a series of further periodontal cleanings called root planings. When a patient comes to the dental office with the beginnings of periodontal disease, he may present with pockets between the teeth, measuring 4 to 5 mm deep. These pockets bleed when the dentist probes them. These patients have actually begun to lose the bone between their teeth. If this is allowed to continue, the bone loss will progress over the course of several years until the bony support of the teeth has been undermined. Patients who fit into this category are generally not given a normal prophylaxis on their initial visit. The first visit is spent doing a thorough examination, including taking measurements of the pocket depths, getting a full series of x-rays, making a correct diagnosis and then explaining the diagnosis and proposed treatment with the patient. This patient is generally brought back to the office for two separate "cleaning" visits. The type of cleaning these patients receive is called a root planing. During this procedure, the patient is thoroughly anesthetized and then the teeth are planed (think of a carpenter's wood plane) using scalers and curettes. For incipient periodontitis, half the mouth is root planed on each of two visits. After this procedure, there is a good possibility that the pockets will shrink provided that the patient institutes good home care, cleaning carefully between the teeth. This is most easily done with Stimudents (toothpicks) or Proxabrushes. Periodontal disease most frequently starts between the teeth because it is between the teeth that patients are most likely to neglect to clean. Left alone, the bone loss continues until the pockets become deeper and deeper, eventually fanning around the tooth to effect the bone on the outside and inside of the teeth. When pockets measure 6 to 7 mm between the teeth, then the patient fits into a more severe classification of periodontal disease. He is said to have moderate periodontal disease. The treatment for moderate periodontal disease is root planing, the same as is done for incipient periodontal disease. But since there is more root exposed above bone line to plane, the patient's mouth is done in four separate visits, one quarter of the mouth per visit. Once the initial periodontal treatment has been carried out, these patients are frequently placed on a three or four month recall schedule to receive periodontal maintenance prophylaxis rather than the normal six months prophylaxis that non-periodontal patients are placed on. Patients who have lost so much bone that they present with a generalized condition of 7 mm or greater pocketing are often treated at the general dentist's office with four quadrants of root planing, similar to the patient with moderate periodontal disease. However, root planing alone is generally not sufficient to halt the disease, and these patients are often referred to a gum specialist (periodontist) for follow-up gum surgery. These patients most often are seen twice a year by their periodontist alternating with twice a year visits to their general dentist for their periodontal maintenance prophylaxis treatments. Once patients with periodontal disease have had their initial periodontal treatment, and if their periodontal disease has been halted, and they are able to maintain their teeth in a disease free state, they become more like a normal prophylaxis patient. However, since they have much more exposed root surface to scale, their "prophylaxis" is more complicated than a regular prophylaxis done on a patient without periodontal disease. These patients receive a type of cleaning called a periodontal maintenance prophylaxis which is somewhat more expensive than a regular prophylaxis, and is generally done three or four times a year instead of twice a year as is done for patients without periodontal disease.